Part of a gift exchange at work or with friends? Have a $20 price limit? We’ve got you covered with four, yes FOUR, options in our games catalog. We’ll be covering each of our games here for the next week, to help you decide which one is perfect for your intended recipient. Today’s pick: Red Hot Silly Peppers! Compete to create the perfect bowl of salsa. What makes your salsa perfect? Hitting the right amount of hotness (or sweetness) before anyone else! Spin the dial to determine the target heat level. Combine your pepper cards of varying heat values to match the target heat level (within 5 points). Use your fruit cards to lessen the overall heat level of your hand. Watch out for the special cards that let you and other players re-spin the dial, swap cards from their hands, and steal your perfectly crafted bowl of salsa! Play until you exhaust the draw pile. Games last 15-20 minutes and are a great way to pass the time while you wait for your chimichangas at your favorite restaurant. 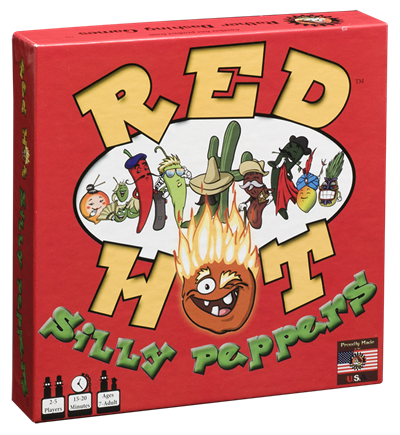 Red Hot Silly Peppers is ideal for ages 7 and up and groups of 2-5 players, this is a fun way to work on math skills with kids! Tip: Try to use as many cards as you can to create your salsa mixes. You get points for cards at the end of the game. Families, casual gamers, kids learning math, and lovers of salsa. Fun Fact: Did you know there is a ranking system for pepper hotness? It was developed in 1912 by Wilbur Scoville and is named after him. The Scoville Scale is a subjective scale based on capsaicin sensitivity, which varies from person to person. That’s why you can eat jalapeños on your pizza, but your cousin can’t handle anything spicier than standard black pepper. Election Day is almost upon us and an informed voter is a dangerous voter, which is exactly what these candidates like –– danger! Supreme Galactic Leader isn’t a job for the faint of heart. It requires a firm grasp of modern warfare and a diplomatic approach to intergalactic relations. Residents of the galaxy have a tough choice ahead of them, one could even say it is an impossible decision. We’re here to help by giving you the rundown on each of the candidates. They may not be perfect, but they are ours. Vote early, vote often, and remember only you can help prevent world peace. Overcoming a tragic childhood where none of his three parents ever took him to the circus, Octomantis has proven he can rise above the petty disappointments of every day life. He works tirelessly to achieve his lifelong dream of being the one and only being left in existence. The Admiral supports the carnivorous diet movement and maintains a healthy, balanced died of his enemies. He was proud to remind us he cannot be defeated since he does not have feet.